Livestock can eat this plant with a little education, and, so can you! Knotweed shoots ready for cooking and eating! This podcast comes to us from WNYC’s “Last Chance Foods.” We thought our readers might enjoy this episode because it gives you some tips for dealing with your knotweed problem by eating it yourself. Here, Marie Viljoen describes foraging in Central Park as a “vigilante” searching out and eating knotweed. In her “Edible Manhattan” article, Viljoen describes what she does with her knotweed harvest. 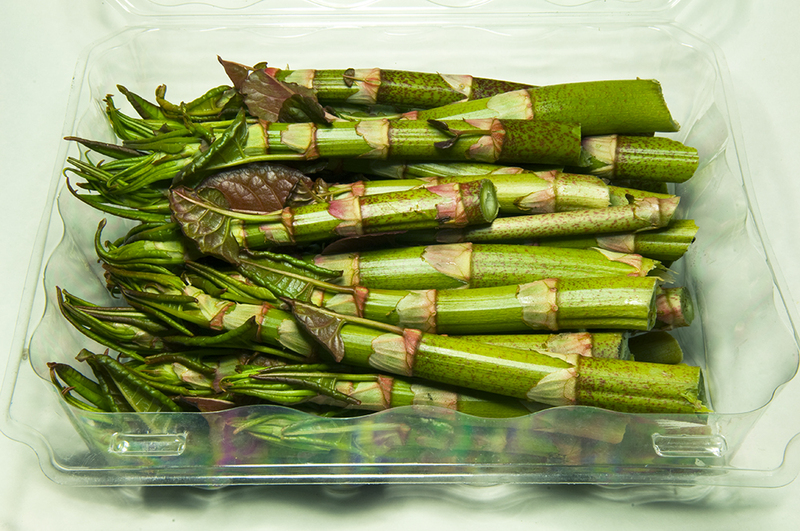 Young leaves can be sauteed with a dab of butter, some salt and pepper, but the stalks can be eaten lots of ways. To get the full flavor of the vegetable, she blanches the stems, dusts them with parmesan cheese and broils them briefly. In risotto she combines finely sliced stems with cream and cheese. She has a soup recipe and even makes a knotweed souffle. And for dessert? Well knotweed creme brulee of course! Are you getting hungry? Here’s a link to Marie Viljoen’s recipe for Knotweed Soup. If you’re in the mood for a sweet treat, here’s a recipe for Knotweed Tapioca. See, with a little outside the box thinking, we can eat our problems!